Chrysler CEO Sergio Marchionne: “The alliance is moving forward rapidly and we are doing everything possible to accelerate the pace and bring about, in the shortest possible time, the birth of a single group, bringing even greater stability and strength to the relationship, in the interests of both partners." DETROIT -- With its government loans repaid six years ahead of schedule, Chrysler Group will now work toward an initial public offering and closer integration with its alliance partner – Fiat S.p.A.
Fiat-Chrysler CEO Sergio Marchionne, speaking on Tuesday at a ceremony to mark the repayment of Chrysler's loans from the U.S. and Canadian governments, said the two companies are increasing the pace of their integration. "The alliance is moving forward rapidly and we are doing everything possible to accelerate the pace and bring about, in the shortest possible time, the birth of a single group, bringing even greater stability and strength to the relationship, in the interests of both partners," Marchionne told journalists and employees at the Sterling Heights assembly plant in suburban Detroit. The next undertaking for the two partners is the homologation of a compact car, based on Fiat architecture. It will probably be built at Chrysler's Belvidere, Illinois, assembly plant starting in the first quarter of 2012, Marchionne said. Using wire transfers, Chrysler today repaid $7.6 billion in loans to the U.S. and Canadian governments, nearly two years after the No. 3 automaker was rescued. The company said it made a payment of $5.9 billion to the U.S. Treasury and $1.7 billion to Export Development Canada -- retiring loans that allowed Chrysler to exit bankruptcy in June 2009. Chrysler completed repayment of the loans six years ahead of schedule. "Less than two years ago, we made a commitment to repay the U.S. and Canadian taxpayers in full and today we made good on that promise," Marchionne said in a statement. "The loans gave us a rare second chance to demonstrate what the people of this company can deliver and we owe a debt of gratitude to those whose intervention allowed Chrysler to re-establish itself as a strong and viable carmaker." With Tuesday's transaction, the U.S. government's stake in Chrysler has been reduced to 6.6 percent from 8.6 percent, and Canada's interest has been cut to 1.7 percent from 2.2 percent, a company spokesperson said. Fiat now owns a 46 percent stake, up from 30 percent, and a United Auto Workers retiree health care trust owns 45.7 percent, down from 59.2 percent. Chrysler's fortunes have been boosted by improved sales as it rolls out 16 new or refreshed models this year. In the first quarter, the company reported a net profit for the first time since exiting bankruptcy under the control of Italy's Fiat. The automaker borrowed $5.1 billion from the United States and $1.6 billion from Canada in June 2009. Chrysler said it has paid $6.5 billion in total to the U.S. government, and $2 billion in total to EDC. The amounts include $1.8 billion in interest. 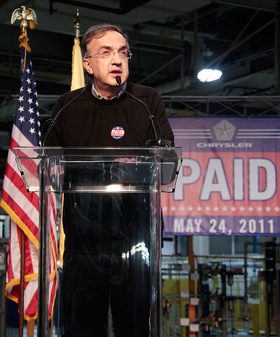 Marchionne used the speech Tuesday to thank the U.S. and Canadian governments, Chrysler employees and his management team for their contributions in Chrysler's recovery. The company distributed red and blue "Paid" buttons to workers to mark the occasion. Marchionne recalled how many analysts had written the automaker off. "I vividly remember how analysts and the press reacted when we announced that within a very short period of time we would fully renew our product range and get our financials back into shape," he said. "I remember the skeptical and patronizing looks on their races. Looks like the one you might give a child when he announces that he's going to be an astronaut when he grows up. Well, we did it! We dared to dream big and we delivered on that dream." President Obama said today the final payment in bailout funds extended by the U.S. government was a "significant milestone" and a sign that the U.S. auto industry is recovering. Last week Chrysler secured new financing that allowed it to pay off the loans. The financing package includes a loan of $3 billion, debt securities totaling $3.2 billion and a revolving credit line of $1.3 billion. The new financing will save Chrysler an estimated $350 million a year in interest expenses. Fiat is now within striking distance of its goal to own 51 percent of Chrysler by the end of 2011. Once Chrysler develops a vehicle that gets 40 miles per gallon on a Fiat platform -- a development expected in the fourth quarter -- Fiat can go to 51 percent. The Italian automaker has options to increase its Chrysler stake to more than 70 percent, Chrysler said this month in a filing with the U.S. Securities and Exchange Commission. Those options include the right to buy the U.S. Treasury's remaining stake in the 12 months after it repays the government. Fiat also has an option to acquire 40 percent of the original stake held by the UAW's retiree health-care trust, Chrysler said. The option is exercisable from July 1, 2012, to Dec. 31, 2016, and in amounts of as much as 8 percent in any six-month period, according to the filing. Marchionne also said Chrysler will move forward with an initial public stock offering. He said repayment of the loans "removes an obstacle to the IPO. It's a lot easier to explain an IPO when you don't owe money to the government." He did not say when an IPO might take place. He has previously said an IPO could take place later this year or next year, depending on market conditions. Ron Bloom, President Obama's assistant for manufacturing, also spoke at the Sterling Heights assembly plant and praised Chrysler's rapid repayment of the loans. "Obviously, the company has moved more quickly even than we hoped," he said. "I don't think anybody would have said two years ago that this would have happened today."